Why Choose our Supplements? There is a difference! You have a choice when it comes to purchasing nutritional supplements. Here at HeartWise Fitness and Longevity Center, we are committed to providing excellent care to our patients as well as products that meet our professional standards of both quality and efficacy. The kinds of vitamins, minerals and nutrients you take do make a difference. The grade, form, purity, bioavailability, and third party verification can make the difference as to whether a nutrient is or is not optimal for you. All of our products are pharmaceutical grade. This grade meets the highest regulatory requirements for purity, dissolution and absorption. Such products can at any time undergo post-production analysis by independent laboratory evaluation. All of the ingredients used in our HeartWise supplement line are gluten free, diary free, and soy free. Furthermore, our products lack any major allergens such as nuts. We do not use any excipients, or inactive substances other than USP Microcrystalline Cellulose and veggie capsules. We use no fillers or flow agents, some of which have been shown to have toxic effects. Everything we carry is made to order, so all of our products are very fresh, as opposed to many other sources which have stock sitting on shelves for quite some time before being purchased. We are committed to providing you only the purest and most effective nutrients at highly competitive pricing. Most agree that the two most important properties of preferred supplements are the quality of the ingredients and the potency. We at HeartWise Fitness and Longevity stand by our product line and its standards. Pharmaceutical Grade: This grade meets the highest regulatory requirements for purity, dissolution and absorption. The finished product must undergo post-production analysis by independent laboratory evaluation. These are the only grade of nutrients that we provide at Dr. Elkin’s office. Medical Grade: Although this is a good product, it is not subjected to the same rigorous testing and standards as Pharmaceutical grade. Prenatal vitamins usually fit into this category. Cosmetic, Nutritional Grade: Supplements of this grade may be sold in some health food stores. These are often not tested for purity, dissolution, or absorption and often do not actually contain the concentrations of nutrients listed on the label. This would also include nutrients sold at Costco, CVS, Whole Foods or Trader Joe’s. Feed or Agricultural Grade: Supplements of this grade are used for veterinary purposes. Do not take supplements of this grade. Herbal products and essential fatty acids like omega-3 fish oils, should have certificates of analysis completed to see if there are any toxic metals present such as arsenic, lead, mercury or cadmium. They should also be screened for contaminants and chemical additives and be analyzed for pesticides, fungicides, insecticides, or other toxic ingredients. We are committed to providing you only the purest and most effective nutrients at highly competitive pricing. We purchase our products from companies that will sell only to licensed healthcare professionals. If you find one of our supplements at a lower cost, we guarantee we will beat that price. If you unsatisfied with a purchase, return it to our office for a credit of ½ the cost you paid, for this product. You can reorder anytime by simply leaving a voice message on our phone order line and we’ll ship you your products anywhere in the world, so you can continue taking them without interruption! Ask about our ‘Monthly Auto Ship Program’ today! VERY IMPORTANT NOTE / DISCLAIMER: Dr Elkin is offering—always—only general information and his own opinion. Always contact your physician or a health professional before starting any treatments, exercise programs or using supplements. This product has been formulated with all natural plant extracts and active molecules that have cardio (heart) protective qualities especially useful in normalizing blood pressure. The major component in this product is olive leaf extract. In an 8 week doubled blinded trial, 1000mg of olive leaf extract was able to reduce systolic blood pressure by 13.7 points and diastolic blood pressure by 4.8 points. Grape seed extract (GSE) contains powerful polyphenols and numerous studies have demonstrated the benefit of GSE on cardiovascular health, including normalizing blood pressure. Quercetin is a natural flavonoid that acts in the body as a powerful anti-inflammatory and cardio protective agent. It has been shown clinically to reduce blood pressure by nearly 3 points in a 6 week trial. Quercetin has a number of other beneficial biologic functions in the body including reducing and preventing allergic reactions, as well as providing antioxidant support. * Major benefits include improving insulin sensitivity (combating insulin resistance), adding antioxidant support, activating insulin receptors and mimicking the action of insulin, without any of the negative effects of this hormone. Insulin is a hormone secreted by the pancreas whose major role is to shuttle blood sugar (glucose) from the blood stream to storage sites such as the liver and skeletal muscles. GlucoWise and GlucoWise Plus have been shown to increase insulin sensitivity making the liver and muscle cells more responsive in recognizing insulin, allowing glucose to enter sites where it can be safely stored, away from the bloodstream where glucose can potentiate damage. The trace mineral chromium is necessary for the full activation of the insulin receptors to accept glucose from the bloodstream. Alpha lipoic acid not only helps to accept glucose independent of insulin, but it also helps to combat the ravages of high blood sugar because of its potent antioxidant effects. Alpha lipoic acid has been used for years in Europe to treat diabetic neuropathy. Cinnamon is also a powerful antioxidant that contains compounds that can mimic insulin. 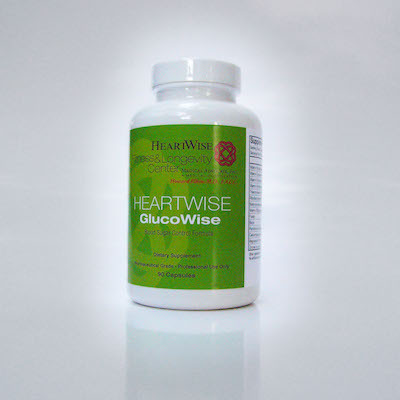 Berberine HCL found in GlucoWise Plus has been studied extensively. It compares favorably to some of the more commonly used oral agents used to treat Type II diabetes in lowering both fasting blood sugar, and also HbA1c, a marker for diabetic control. It also can improve liver function and reduce cholesterol. This formula is generally reserved when optimal results are not obtained with Glucowise. Homocysteine is a breakdown product of the amino acid methionine. When elevated it can be associated with coronary heart disease by damaging the inner lining of the blood vessels, thereby setting the stage for plaque formation. Elevated levels of homocysteine have also been linked to Alzheimer’s disease, depression, cervical cancer, and even increased risk of miscarriage. Elevated homocysteine levels are also a known cause of inflammation. There are three B vitamins that assist the body in converting homocysteine back into methionine. These are B6, B12 and B9, the latter commonly known as folate. HomocysteineX has these key nutrients in their biologically active form. Of note is the fact that many preparations on the market use the inferior and less expensive synthetic product folic acid. Essentially all breakfast cereals, cookies ,crackers and packaged goods have been fortified with folic acid, mandated by the FDA to help prevent neural tube defects in pregnant women. The problem is that now we are seeing Americans with excessively high levels of folic acid, due to the popularity and availability of such processed foods. Although not universally accepted, there are some studies that have implicated high folic acid levels with colon polyps and colon cancer. HomocysteineX, on the contrary, uses only natural occurring folate. HomocysteineX is also a strong methylating agent which not only helps in the conversion of homocysteine into methionine, but it also assists the liver in metabolizing certain drugs and hormones into less toxic compounds. Such an example is estrogen. HomocysteineX contains DIM which is the most active cruciferous substance for promoting beneficial estrogen metabolism in both women and men. DIM is naturally found in cruciferous vegetables, such as broccoli, cauliflower, cabbage and Brussels sprouts. Estrogen metabolism and methylation should be optimized together to ensure proper detoxification of estrogen in both men and women. Although usually thought to be a woman’s problem, please note that men produce less testosterone as they age, and yet they convert much of their testosterone they do produce into estrogen. A 58 year old male generally has a higher estrogen level than a 53 year old female ! Therefore, optimizing estrogen balance is vital for both women and men as they age. This formulation up regulates the inhibitory neurotransmitter GABA. Neurotransmitters are chemical messengers in the brain. GABA aids in reducing anxiousness, tension and fear while helping to induce sleep . Phenibut mimics the action of GABA and is structurally similar to GABA It readily crosses the blood brain barrier and allows for relaxation and sleep induction. Valerian root extract is the most studied botanical sleep support and relaxation aid. The active ingredient , Valerenic acid stimulates the release of GABA and binds avidly to GABA receptors. Melatonin is a hormone that plays a major role in the human sleep cycle. Our production of this hormone diminishes as we age, and thus, supplementation is often useful in restful sleep. Melatonin has also been shown to play a role in the anti-aging process, and has anti-carcinogenic properties as well. Magnesium is a natural occurring mineral that plays a role in over 300 chemical reactions in the human body. Numerous studies have shown its beneficial effects on natural relaxation and sleep. The adrenal gland is the body’s barometer for both physical and emotional stress. These two little glands, the size of a pea, lie atop each kidney. They are responsible for the body’s fight or flight stress response. They secrete several hormones, one of which is cortisol, the stress hormone. When the body is under chronic stress the body’s demands for cortisol overrides the body’s production of other hormones such as DHEA, estrogen and testosterone. This results in an imbalance and the body eventually loses its ability to adequately respond to stress. The end result is a loss of energy, cognitive function, motivation and performance. The ingredients in AdrenWise are designed to support the ailing adrenal gland. These include vitamins that are essential for adrenal health and adaptogenic herbs that help modulate the body’s stress response and increase energy levels. * This formulation is a synergistic blend of potent anti-inflammatory botanicals and herbs. Inflammation has become the buzz word of the 21st century, and for good reason, as I consider it the bane of our existence when it comes to the aging process. Nearly all diseases of aging have inflammation as the common dominator. This includes what I call the 5 BIG ONES: coronary heart disease, cancer, diabetes, auto-immune disorders and Alzheimer’s disease. This formulation is a synergistic blend of potent anti-inflammatory and therapeutically dosed botanicals and herbs. The function of these ingredients is to inhibit or modulate various inflammatory mediators. Moreover, these ingredients also have very potent antioxidant effects. InflammaWise is designed to support and balance the body’s anti-inflammatory system and to reduce chronic inflammation. No one would doubt that a healthy immune system is paramount when it comes to health and longevity. It is essential to ward off the common cold and respiratory tract infections such as the flu as well as community acquired pneumonias. But besides helping to lessen our chances of contracting such illnesses, a healthy immune system additionally promotes faster recovery. Also strong immunity helps both in cancer prevention, and in the survival of afflicted patients.